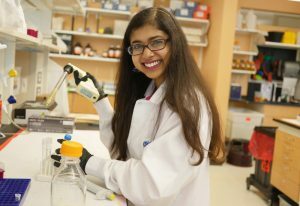 Meena Chakraborty ’19 has spent two years in the lab of Nobel Prize winner Philip Sharp, combining computer science and wet lab techniques to study the impact of microRNAs on gene expression. When Meena Chakraborty was eleven years old, her parents took her to South Africa to show her what life was like outside her hometown of Lexington, Massachusetts. The trip was first and foremost a family vacation, but what struck Chakraborty, now a junior at MIT, was neither the sights nor safaris, but their visit to a children’s hospital. Looking back, she identifies that experience as the catalyst that spurred her current career path, centered on three years of biology research with implications for human health. Given her propensity for math, she declared Course 6-7 (Computer Science and Molecular Biology), as a means to develop analytical tools to decipher large data sets and better understand biological systems. The summer after her freshman year, she had her first chance to marry these two skills in a real-world setting: she began working in the lab of Nobel Prize winner Philip Sharp, located in the Koch Institute for Integrative Cancer Research. This was her first foray into computational biology, but it wasn’t her first time at the Koch — she’d shadowed two graduates students in the Irvine lab for a summer as a junior in high school. This time, though, as an undergraduate, she was assigned her own project, under the guidance of postdoctoral fellow Salil Garg. Together, they’ve studied a type of RNA known as microRNA (miRNA) for the past two years. Messenger RNA (mRNA) — perhaps the most well-known of the RNAs — constitutes the intermediate step between DNA and the final product of gene expression: the protein. In contrast, miRNAs are never translated into proteins. Instead, they bind to complementary sequences in target mRNAs, preventing those mRNAs from being turned into proteins, and blocking gene expression. This miRNA-directed silencing is widespread and complex. In some cases, miRNAs silence single genes. In others, multiple miRNAs coordinate to turn groups of genes on and off in concert, thereby controlling entire sets of genes that interact with one another. For example, two years ago, Chakraborty’s mentor used computational methods to pinpoint a group of poorly expressed, understudied “nonclassical” miRNAs that appear to coordinate the expression of pluripotency genes. Pluripotency gene levels dictate the behavior and fate of embryonic stem cells — non-specialized cells awaiting instructions to “differentiate” and assume a particular cell type (skin cell, blood cell, neuron, and so on). Chakraborty then used a technique known as fluorescence-activated cell sorting (FACS) to determine how nonclassical miRNAs affect gene expression in embryonic stem cells. She used a FACS assay to detect miRNA activity, engineering special DNA and inserting it into mouse embryonic stem cells. The DNA contained two genes: one encoding a red fluorescent protein with a place for miRNAs to bind, and another that makes a blue fluorescent protein and lacks this miRNA attachment site. When the miRNA binds to the gene expressing the red fluorescing protein, it is silenced, and the cell makes fewer red proteins compared to blue ones, whose production remains unhindered. Chakraborty is excited about what this finding could mean for cancer research. A growing number of studies have shown that some cancers arise when miRNAs fail to help embryonic stem cells interconvert between cell states. Although she spends anywhere from four to 20 hours a week in lab, Chakraborty hasn’t lost sight of her extracurriculars. As co-president of the Biology Undergraduate Student Association, she serves as a liaison between biology students and faculty, coordinating events to connect the two. As the discussion chair for the Effective Altruism Club, she promotes dialogue between student club members regarding charities — how these organizations can maximize their donations, and how the public should decide which ones to support. As a volunteer for the non-profit Help at Your Door, she inputs grocery lists from senior citizens and disabled individuals into a computer program, and then coordinates with community members to deliver the specified order. Last summer, she was accepted into the Johnson & Johnson UROP Scholars Program, joining approximately 20 fellow undergraduate women in STEM research at MIT during the summer term. Her cohort attended faculty presentations, workshops, and networking events geared towards post-graduate careers in the sciences. Most recently, Chakraborty was a recipient of the 2017-2018 Barry Goldwater Scholarship Award, selected from a nationwide field of candidates nominated by university faculty. She will also remain on campus this coming summer to conduct faculty-mentored research as part of the MIT Amgen Scholars Program. 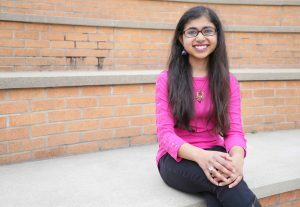 After she graduates in 2019, Chakraborty intends to pursue a PhD in a biology-related discipline, perhaps computational biology. After that, the options are endless — professor, consultant, research scientist. She’s still weighing the possibilities, and doesn’t seem too concerned about selecting one just yet.